Painting ceilings can be tricky. I’ve already covered how to paint textured ceilings on DIY Painting Tips, but today, I want to go over how to paint high ceilings. Over the years, high ceilings have become more and more popular. According to this New York Times article, around 2000, 9-foot ceilings became more common in new homes than 8 foot and more recently, 10-foot ceilings have become the most common. 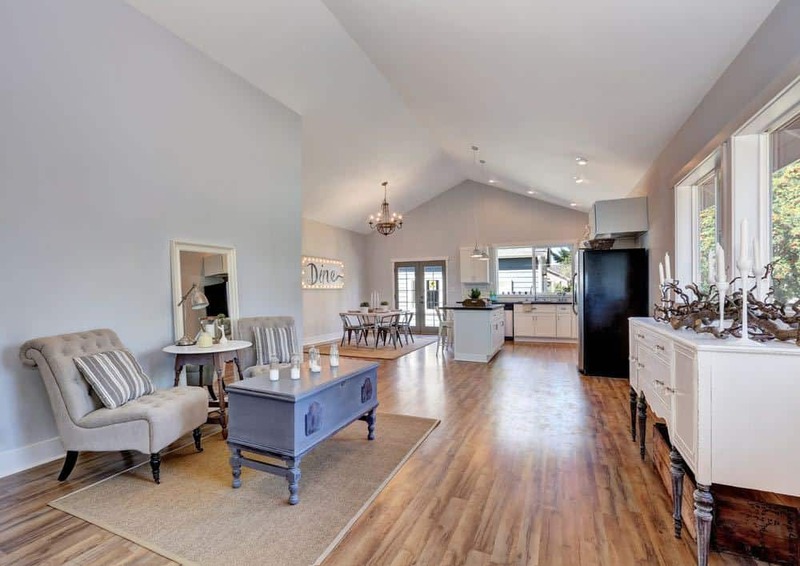 With a standard of 9-10 feet, and lots of open living rooms and vaults, high ceilings are very common these days. As with everything in painting, if you know a few tricks, have the right equipment and take your time, you can safely do any project and get professional results. The fist thing we have to discuss when talking about painting high ceilings is how are we going to define “high”? Obviously, 8 foot ceilings are normal height and I don’t consider 9 foot ceilings high. For this post, I am going to be referring to high ceilings as any ceilings 10 feet up to 18 feet high. Personally, I haven’t run into any ceilings higher than 18′ in a residential home, so I won’t be covering that here. 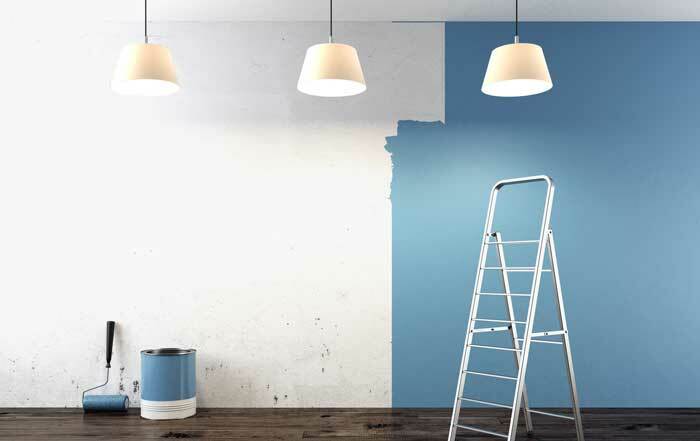 There are some basic tools you’re going to need for painting high ceilings. 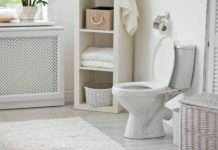 Most of these tools are handy to have around the house for other projects, so I consider them a good investment for most homeowners. 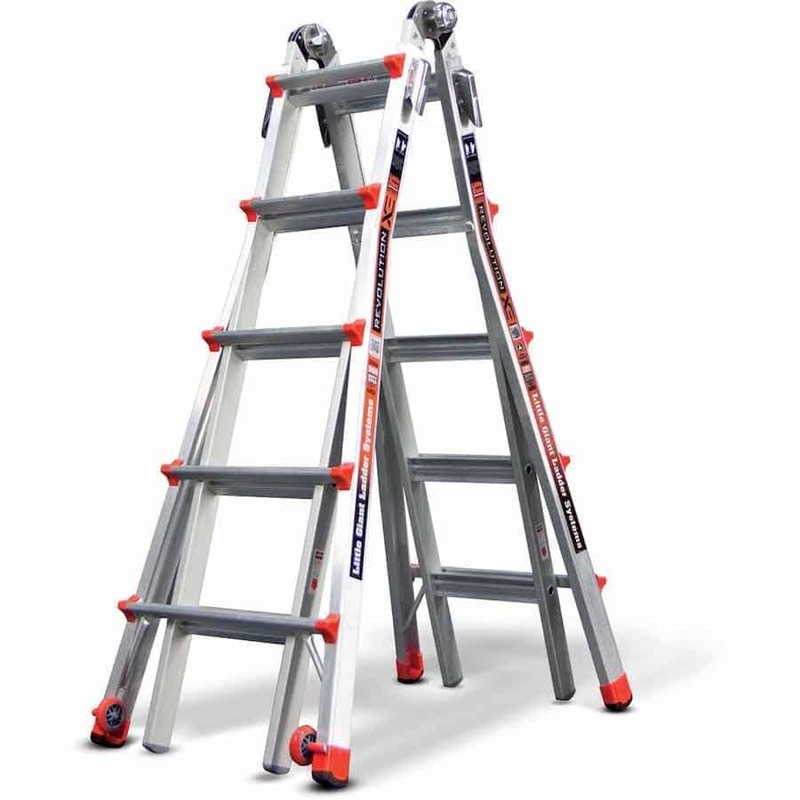 The Little Giant Ladder is simply one of the most versatile ladders on the market today. This one ladder will replace your entire collection of ladders. You can use it as an a-frame ladder, a basic extension ladder and even split it apart into two smaller ladders when needed. With its lifetime warranty, there really isn’t a better more versatile ladder on the market. 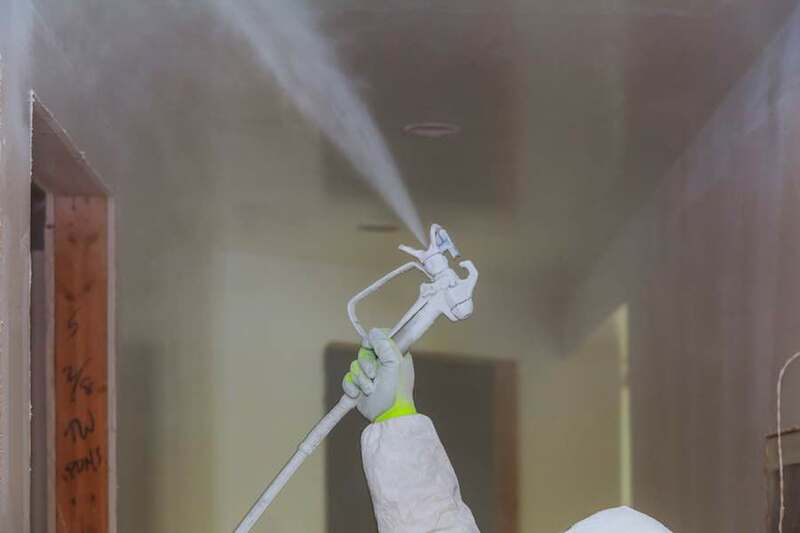 An airless paint sprayer is an incredibly versatile sprayer that can be used to paint ceilings, walls, prime drywall, enamel cabinets, paint exteriors and stain fences. 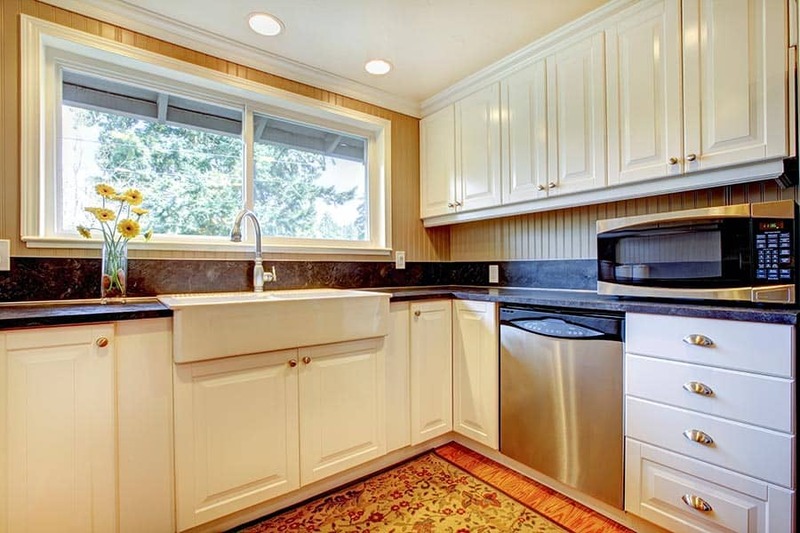 Airless sprayers are perfect for your average homeowner, handyman or painter. Personally, I love Graco sprayers since they have models perfect the DIYer and the professional alike. 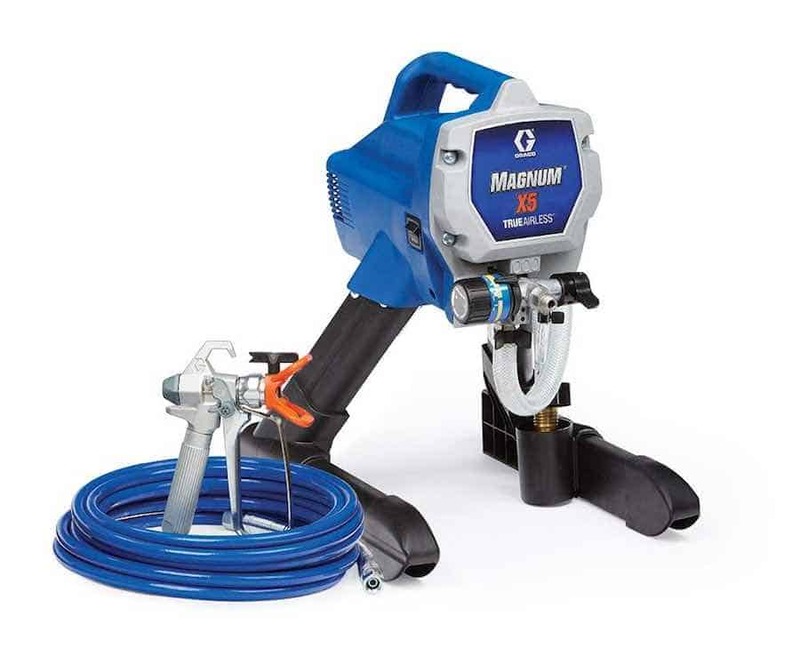 The Graco Magnum X5 is the perfect entry level around sprayer that I recommend most. A sprayer extension tip is long skinny metal pole that attaches to the tip of your spray gun and will give you an extension of typically 12-30 inches. 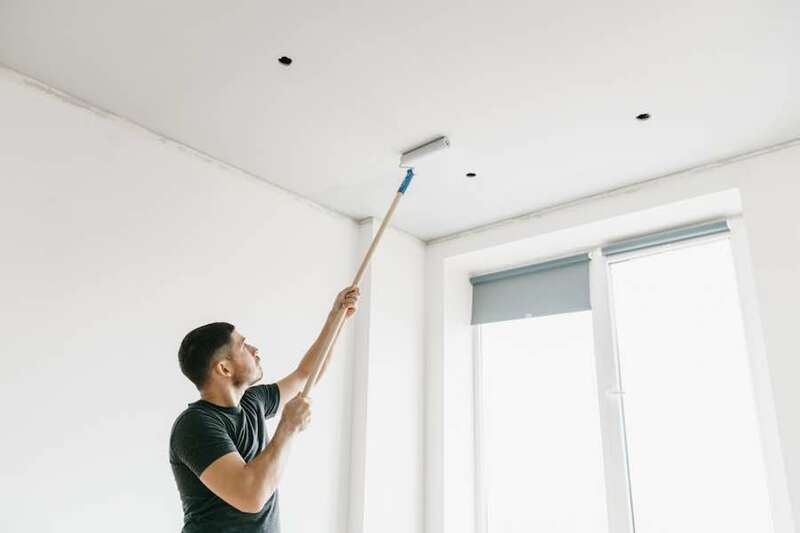 When you are spraying high ceilings, these extension tips are worth their weight in gold as they will allow you to reach higher, move your ladder far less and ultimately paint much faster. If you don’t plan on spraying your ceilings and/or don’t want to invest in a sprayer, then an extension pole is going to be what you need to get your high ceilings painted. You can attach roller frame to the end of an extension pole and reach heights otherwise unreachable. You can get poles in any size but for high ceilings, a 4-8 foot pole or a 6-12 foot pole would be ideal. Ryan’s Note: Painting a high ceiling with an extension pole is going to be slow and physically exhausting, just a word of warning. A work plank is a flat plank that is typically 12″ wide and different models will telescope between 6′ – 15′. Personally, I don’t love working on planks unless they are low to the ground. They are nice for doing projects in the 8-12 foot range, but any higher and I don’t feel particularly stable on them. Little Giant makes my favorite work plank for its durability and lifetime warranty..
You actually have a lot of different options to choose from when painting high ceilings. Which option is best is going to depend on what type of ceilings you’re going to be painting, how big your room is, the equipment you already own, and what your budget is. I am going to cover each different strategy for painting ceilings and when that strategy is your best option. Perfect For: 10-foot ceilings. Any texture as long as the texture is not coming loose. Painting your high ceilings with an extension pole and roller is a good option as long as your ceilings aren’t too high. I like to roll out ceilings if they aren’t too big and the ceiling is 10′ high or less. This method is slow and can be very slow and tiring on the body if you are trying to paint ceilings higher than 10 feet. Perfect For: 10-18 foot ceilings. Ryan’s Note: This is the method that I use on almost every high ceiling that I paint. Spraying is easier and faster, I can quickly move my a-frame ladder around the room, and the extension tip allows me to spray a much larger area in every position so I don’t have to move my ladder nearly as often. Ideally, you are going to want to spray your ceilings if at all possible. A small airless paint sprayer and a 30″ extension tip should allow most people to paint ceilings with a height up to 12 feet. 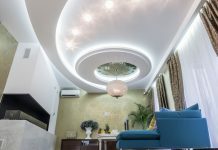 Spraying your ceilings is drastically faster than rolling, gives a better looking finish, won’t damage textured ceilings, and is easier on the body. Combine this method with an A-Frame ladder like the Little Giant Quantum, which has a standing height of 9 feet 1 inch when in the A-Frame position, and you should be able to paint ceilings up to 18 feet high without a problem. If you take the reach of the average male, which is 7.5 feet, add in the 3 foot extension tip onto your spray gun, while standing on a 9 foot a-frame ladder, and you’ve got an easy reach of 19 feet. Using a Little Giant work plank between a separated Little Giant ladder. Another option for painting your ceilings is to set up ladders and planks. This method works for any size room. Simply position two ladders, typically a-frame, across from each other and place a work plank crossing from one ladder to the next. 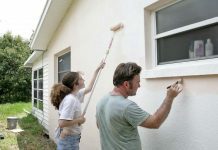 This method is still going to work best with a sprayer and an extension tip, which will allow you to paint higher without having to stand higher and it will allow you to paint a larger area. Personally, this method doesn’t offer me enough of a benefit over just moving an a-frame ladder around the room more often. Sometimes the occasion can arise where you’d like to get your ceilings painted but not your walls. Typically, I’d recommend against this as painting your ceilings but not your walls are difficult and inefficient, but sometimes it just needs to be done. Simply put, if you want to paint your ceilings but not your walls, you are going to need to run a strip of tape around the top of your walls perfectly in the corner between the wall and the ceiling. Once you have a strip of tape on the top of the wall around the entirety of the room, you’ll want to attach a sheet of plastic to that tape that is the same height as your walls. If you have 9 foot ceilings, you want 9 foot plastic and so on. 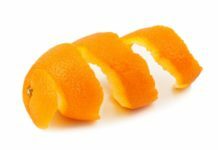 You may also need to use additional tape to get larger sheets of plastic to adhere without falling. Painting high ceilings isn’t really all that difficult. With the right tools and a little bit of knowledge, all painting projects can be easy DIY projects that anyone can do. Did you do this project? How did it turn out? Let me know in the comments below! 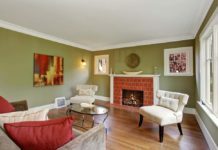 Next articleHow Much Does It Cost To Paint A Ceiling?